We use trade marks on our products to promote them, show ownership and indicate quality. Our logos are trade marks. As they’re valuable to us, we’ve added extra legal protection by getting some of them registered. This helps us guard our intellectual property in actions against infringers, who might try to misuse them. The DVSA corporate logo isn’t registered as a trade mark, but it has special protection from misuse because it incorporates the Royal Coat of Arms. It can be a criminal offence to misuse this. You may be eligible to use the Pass Plus logo if you’re an ADI on the register of Pass Plus instructors. 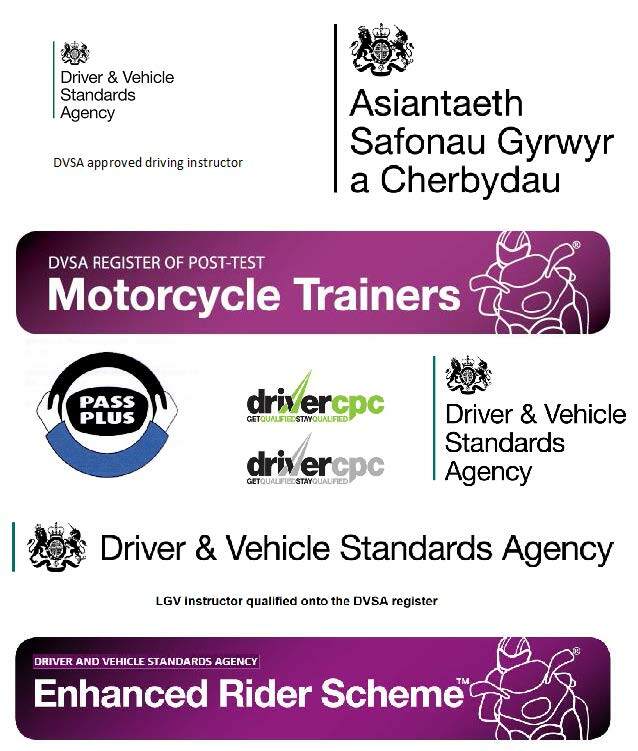 You may be eligible to use the RPMT and ERS logos if you’re a motorcycle trainer on the register of post-test motorcycle trainers. You may be eligible to use the Driver CPC logo with a strapline if you’re a training centre or body that has been approved to deliver periodic training. Read our guide to learn more about our logo usage eligibility rules. Once we receive it, we’ll check it and then aim to get back to you within 10 working days. If we approve your application, we’ll send you the logo files to use. If your application is unsuccessful, we’ll let you know why. We pursue people who misuse a DVSA trade mark. Such misuse can include falsely claiming ‘endorsement’ or an association which doesn’t exist. We know that the majority of you who use our trade marks do so properly, and stopping trade mark misuse will benefit all legitimate users. Hi I already have permission to use the logo DSA on my stationary and adverts do I need to apply to use the new DVSA logo? Hi Mr Pickavant. You're right to consider replacing your DSA logo with the DVSA logo, as of course DSA merged with VOSA to form DVSA in early 2014, so the DVSA logo represents the new organisation. Read the guide at https://www.gov.uk/guidance/get-permission-to-use-dvsa-logos and complete and return the application form from that web page. We'll then be in touch.